Exceptionally unique styles, canvas and leathers in every color of the rainbow, custom molded hardware, and a signature look all embody the Hayden Harnett brand. 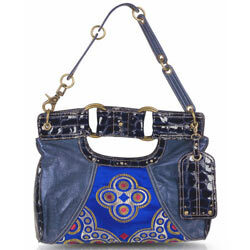 Funky prints, washed leathers, and multitudes of pockets make their handbags both functional and fun. Designed by a hip couple with eclectic backgrounds, the Hayden Harnett brand has quickly gained recognition among fashionistas for its versatile, playful collection. High quality materials and superior manufacturing result in very well-made totes, that are designed to outlast the ‘It’ bags of each season. The Mercer Clutch ($287), is a Hayden Harnett favorite. A detachable strap converts the clutch to a shoulder bag. This limited edition bag incorporates a gorgeous kimono fabric with solid and embossed patent leathers, and signature hardware and luggage tag. A belt handle allows you to carry it as a clutch; the larger size allows you to carry more than your wallet. The Tokyo Clutch ($238), comes in a glossy chestnut with a complementary centered snake panel and a ‘stowable’ chain link strap. 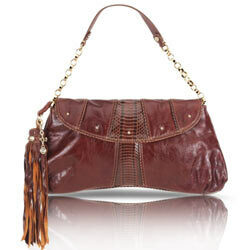 A thick, crinkled tassel adds an edge to the otherwise classy purse. 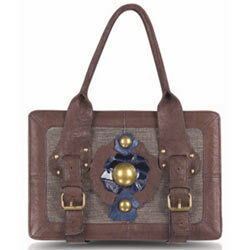 The Ana Frame Bag ($325), is a large, playful approach to the satchel. A large rear pocket and slanted buckle straps conjure up images of a jumper, with a modern take on the childhood outfit. Adjustable straps add versatility, and the zip top keeps your stuff safe, while the front center pocket keeps your essentials within reach. 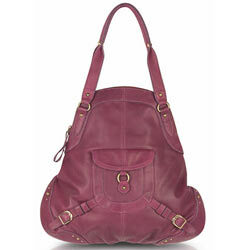 The Margot Kiss-Kiss Satchel ($338), is a superbly structured, box-shaped satchel, with a trio of stylish compartments. A luscious combination of chocolate linen and leather is adorned with brown and blue leather rosettes, brass baubles, and adjustable straps sent through an unusually shaped handle.